It seems that LG is so excited about the handsets it will be flaunting at MWC 2013 that it's gone and announced them ahead of the Barcelona event. Only yesterday we heard more rumours suggesting that the Korean firm is lining up a new range of phones to come under the L Series 2 banner, and those reports appear to be true. LG has confirmed that it is launching the Optimus L7 2, Optimus L5 2 and entry-level Optimus L3, with the L7 II being the first of the trio on the market as it's set to make its debut in Russia this week. The handsets will replace the original LG Optimus L7, Optimus L5 and Optimus L3 which arrived at MWC last year, and failed to really set the world alight. None of the offerings are particularly scintillating in terms of features with the LG Optimus L7 2 sitting at the top of the pile with a 1GHz dual-core processor, 768MB of RAM, 4GB of internal memory, 4.3-inch IPS display, 8MP rear camera, VGA front camera and a 2,460mAh battery, but at least it's running Android Jelly Bean. There are less specs available on the Optimus L5 2 and Optimus L3 2, with the L5 sporting a 4-inch display and 1,700mAh battery. The entry-level Optimus L3 2 packs a 3.2-inch display and 1,540mAh battery, with pricing and global availability currently unknown for the handsets. 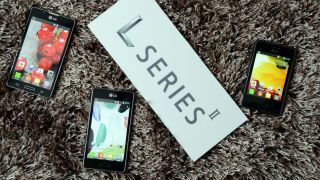 TechRadar will be getting to grips with the new L Series 2 range at MWC 2013, so look out for our first impressions in our hands on review.